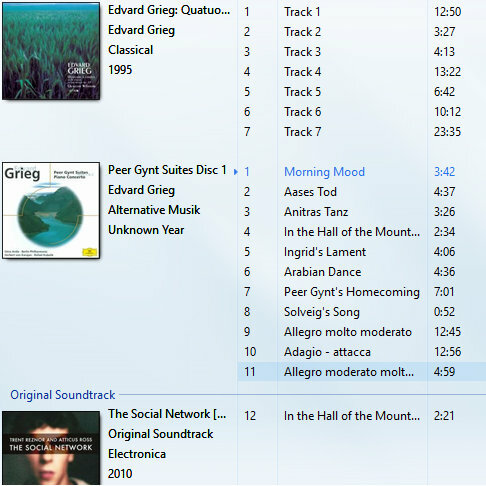 Get your Grieg playlist to hand. One of the Slow TV shows in development for broadcast later this year is a marathon play through of all Grieg's 74 opuses. I've long thought of a substantial work of classical music as a perfect illustration for the complete-feeling of well made Slow TV. Somewhere between Handel's Messiah or Wagner's Ring Cycle. The UK radio station Classic FM has The Full Works Concert which often allows a work to be expressed more fully than the popular few minutes that make it onto compilations. Which illustrates visual media quite well - it's edited down to the most exciting, stimulating shots and takes, which keeps attention but then extracts a lot of other good moments. And that sense of wholeness. Speaking of wholeness, June 15th this year marks 175 years since Grieg was born, and so, the Norwegian broadcaster NRK2 will be showing a 30 hour live show of his work. Now, that is a Full Works Concert. Different locations are currently hosting the production including Grieghallen in Bergen, NRK's studio in Marienlyst in Oslo and Grieg's hometown of Troldhaugen. The success of Slow TV in Norway owes a lot to tapping into subjects and themes of regional and national identity. This certainly keeps up the trend - NRK producer Thomas Hellum comments that "This is the soundtrack to Norway". It isn't the first time Slow TV has been themed around music; in 2014 the entire 899 hymns of the Norwegian Hymn Book were sung live over two and a half days. "Most concerts take place in Bergen. The orchestral works will be performed at the Grieghallen and the Large Studio of Bergen Philharmonic Orchestra and the Orchestra Orchestra (KORK), while the main emphasis of the works - piano pieces, songs and chamber music in general - will be performed at Troldhaugen. " "We start at 18:00 on Friday 15 June... Peer Gynt in stage version around 0100 Saturday, Rondane at sunrise, Holbergsuiten for lunch Saturday, Haugtussa for dinner, and finally Psalms - Grieg's last opus - at the tomb at Troldhaugen late Saturday night." We could bring this to an American context with a marathon of the works of Aaron Copland. Who would be a corresponding British composer: perhaps Gustav Holst? Ooh good, question; got me thinking. I would say either Handel (though German, became British), or probably Elgar. It would need to satisfy patriotic sentiment, so as Elgar wrote the tune for "Land of Hope and Glory", I would go for that. It's used as the crescendo piece for The Last Night of The Proms, a series of summer concerts in the UK on TV and Radio... have a look at the last 90 seconds here for a rare display of British patriotism! https://youtu.be/gLKSDT_2zPA?t=5m48s (More than half of the population thought Land of Hope and Glory ought to replace 'God Save the Queen' as the national anthem, which has been replaced by Jerusalem as a wish.